Australia/Canada, 2010, 90 minutes, Colour. Michael Shanks, Alexandra Davies, Indiana Evans, Bruce Davison, Robert Mammone. Directed by Brian Trenchard- Smith. Since the icy blast which powers down through the ozone layer to produce a mammoth freezing originates south of Hobart, the title seems anomalous by a full hemisphere. 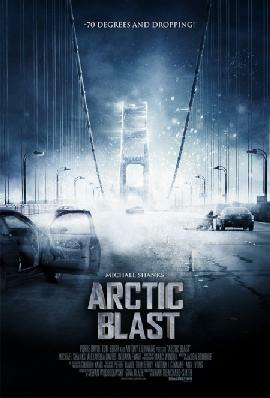 Surely Antarctic Blast would not have been box-office poison! Actually, it wasn’t the box-office takings since this film was released straight to DVD. It is a close relation to The Day After Tomorrow, with the world freezing, not just North America. And it is a close relation to all those disaster films where the lone hero has the solution to the global problems (this one seems remarkably close the explosions at the end of Armageddon) and the obtuse superior wants to go his own way. But, it is not a close relation to The Day After Tomorrow or Armageddon in terms of budget, special effects or cast. These are quite minimal. That being said, and allowing for all the impossibilities, coincidences, heroics and challenges to physics laws and action, it is a passably undemanding 90 minutes disaster entertainment. If you are demanding, let it pass. It’s not many films that can boast of being filmed in Hobart – and there are many attractive shots of the city and of Tasmania (before the ‘arctic’ blast arrives and ices up everyone and everything). Our hero is an American working in Tasmania (Michael Shanks), married to a wife who feels he is work-preoccupied – there is nothing like a global disaster problem to put paid to this difficulty! He has a teenage daughter who feels neglected and has the touch of rebellion (though she survives but her two friends are iced). Meanwhile his boss in Philadelphia (Burce Davison) is not too sympathetic and wants answers, wants data – and wants them now. But, it is not only Hobart which bears the brunt of the blast, which as it gathers pace, looks like a pursuing tsunami – and there is a certain amount of morbid enjoyment in seeing it overwhelm popular world landmarks like Big Ben and the Eiffel Tower. Brian Trenchard Smith, who has made a long career of making this kind of film, directs a cast, mainly of Australians, who do their best to co-operate with the hero and save the world. Old-style matinee material – with a sparing use of modern effects. 1. A disaster film, their popularity? Apocalyptic? Themes and threats to the world? 2. The screenplay as derivative, The Day After Tomorrow, Armageddon, 2012...? 3. The title, the reality of the Antarctic blast? 4. The Tasmanian settings, the ocean, Hobart, the countryside? The contrast with Philadelphia? The city, business centres, laboratories? The contrast with Sydney, the scenic aspects, tracking devices, the glimpses of other cities like Paris, London…? The musical score? 5. Audience familiarity or unfamiliarity with the Southern Ocean? Scientific research carried out, the boat, the personnel, the routines? The blast and the information, the ozone layer? The sudden deaths on the ship? The blast on the loose, visualised, like a cloud of tsunami? It being in pursuit of people? The streets of Hobart? The effect, freezing and overpowering humans? 6. Jack, his work, relationship with Emma, love for Naomi? The stresses on the marriage, the discussions about divorce, the lawyer? Dividing the property? His being busy? Going to work, his wife going to her parents? Her daughter going off with friends? 7. The first shock, Jack and his driving, being ahead of the tsunami, the peril? His assistant, her diabetes and collapse? Rescuing his daughter, the death of the other two? Tensions? On the shore? Fleeing? 8. The contrast with Philadelphia, Winslaw and his obtuseness, his assistant, his relationship with Jack, his personal approach, the situation, the deals? The solution, Jack opposed, his being a diehard? 9. Sydney, the office, the crises, the personnel in handling the situation? 10. Jack, his decision to go for the medication for the diabetes, the owner of the shop and his tension, the gun? Arriving back in time? 11. The expertise, Emma, his daughter, in the laboratory? Emma’s parents, their neighbour, taking in the woman, her death? 12. The calculations, ideas for stopping the spread of the blasts? The Northern Hemisphere? 13. The need for warmth and survival? So many not surviving? 14. The ozone layer, the issue of the rockets, mending the layer, stopping the cold, the world returning to normal? 15. The plausibility of this scenario? Presented as possible? 16. Science, ingenuity, intuitions, technology, hope?